Table. Height is adjustable in 1" increments from 24"–34". 30"W x 73"L. Upholstered in luxurious NatuSoft™ vinyl. Rubber feet provide a secure grip on tile or wood floors. Shimmy-Lok™ Leg Brace System, s unique dual post leg stabilizer, eliminates the most common cause of leg instability. Weight capacity: 450 lbs. Weighs 26.2 lbs. 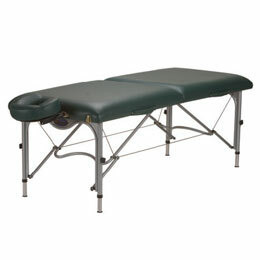 Includes deluxe adjustable head rest and carrying case.